Breakfast in Kathmandu and all meals while in the trek. 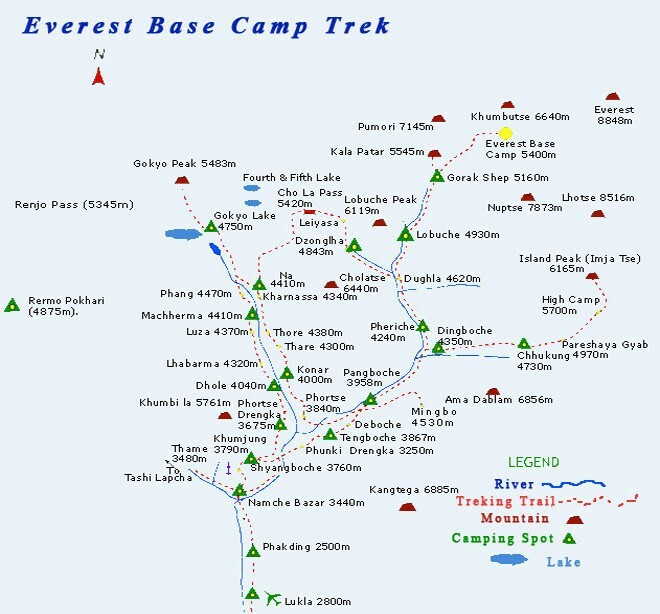 Everest base camp trek is one of the very popular trekking trips in Everest region. This trek takes you to the base of world’s top Mountain Everest. Everest base camp trek starts from Lukla and reach to Tengboche monastery on the way it complete the romantic journey of beautiful places such as Phakding, Jorsale, Namche bazaar and Syangboche. During the Everest base camp trek Tengboche monastery provide relief to the trekkers with stunning glimpse of beautiful mountains such as Everest (8848m. ), Lhotse (8516m. ), Amadablam (6812m. ), Nuptse (7855m. ), Island peak (6189m. ), Kongde Himal (6200m. ), Thamserku (6430m. ), and Khumbila (5761m.). Beside the stunning glimpse of the mountains this monastery is also famous for Mani Rimdu festival which is the important festival of Sherpa. During the time of Mani Rimdu festival this monastery is artistically decorated and large number of Sherpa people around the Khumbu region gathers there to celebrate Mani Rimdu festival. After enjoying in the Tengboche monastery trek climb to Pangboche, sites of Khumbu’s oldest Gompa where a yeti scalp and hand relic are displayed. From Pangboche trek follows the Imja Khola which leads east towards the high settlements of Dingboche and Chhukung. The Mountain viewpoint of Chhukung offers superb views of the ice draped southern face of the Lhotse to Nuptse massif. From the confluence of the Imja Khola and Lobuche Khola, the left hand route climbs gradually to Pheriche an unimpressive settlement with tea shops and trekkers’ medical post. From there trek finally reach to Everest base camp which offer striking views of beautiful mountains such as Everest, Ama Dablam, Lhotse, Nuptse, Island peak, Lobuche peak and Kwangde. Everest base camp trekking is also famous for local culture and festivals. Main ethnic people of this region are Sherpa who follow Buddhist religion and live their own unique life style with their own culture and festivals. Trekking routes of Everest base camp pass the important typical villages of Sherpa where trekkers can know and experience the Sherpa culture and religion. Moreover in Everest region there are numerous colorful Monasteries, Gompas, Chörtens and Mani walls which will give the sacred feeling to the trekkers. Highlights of the trek, stunning glimpse of beautiful mountains such as Everest, Lhotse, Amadablam, Nuptse, Island (6189m. ), Kongde Himal, Thamserku, and Khumbila. Sherpa culture and festivals, Monasteries, Gompas, Mani walls, Chörtens, Flora and Fauna of Sagarmatha national park. Day 01: Arrival in Kathmandu- 1350m/4,428ft. Meet and transfer to hotel. Yala Adventure's representative will be receiving from Kathmandu Airport and transferred to your hotel. We will again follow the path of Mt. Everest and Dudhkoashi River.We will trekked more 400 meters on that day and reached to an altitude of 3,870m and reach Tengboche. We will visit Tengboche Monastery where we will see incredibly ornate wall hangings, a 20-foot sculpture of Buddha, and the musical instruments and robes of the Lamas. The group will be taken to observe a prayer ceremony either in the evening or in the morning dependent their timing. After Tengboche, the trail drops to Debuche, crosses another suspension bridge on the Imja Khola, and climbs to Pangboche amongst thousands of mani stones. Our uphill trek continues till the traditional Sherpa village of Dingboche with its exquisite views of Lhotse, Island Peak, and Ama Dablam and some other mountains. This day is another acclimatization day for our trek. We will take a hike to Nangkartshang Peak just above Dingboche from where you will see the excellent view point especially of the gorgeous view of Mt. Ama Dablam. After breakfast we will walk continues along the lateral moraine of the Khumbu Glacier and passes by stone memorials for climbers who have perished on nearby summits. We continue to climb as we are heading to the village of Lobuche which is located at the foot of Lobuche peak. 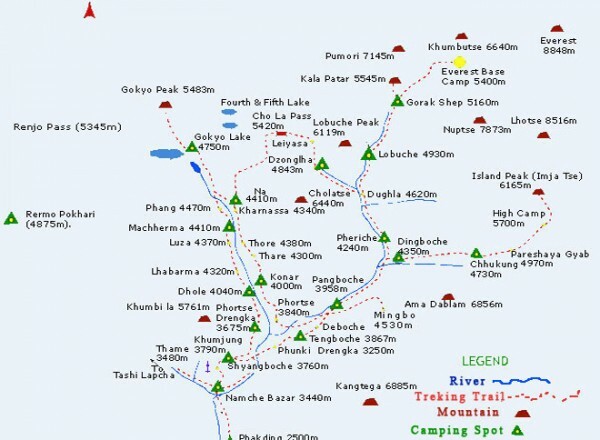 We will have another difficult day walk along the Khumbu Glacier and up to Gorekshep. We will leave our luggage at Gorekshep and walk to Everest Base Camp. You will have the best view of Khumbu Icefall from Base Camp. On the way back you may see the Gorekshep vally, Mt. pumori and some other mountains. Early morning you will trek to Kala Patthar from where you will see the best and rewarding view of Mt.Everest range, Everest panorama view and Mt. Nuptse, Pumori, Chagatse, Lhotse and countless peaks. 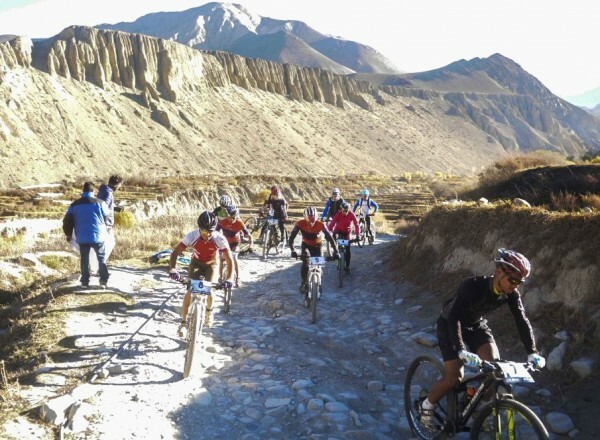 We make a quick descent to Gorak Shep, take breakfast and trek back to Pangboche. We will have a farewell dinner in Kathmandu. You may share your experience with our office barriers. Day 16: Transfer to the International Airport for your departure flight.